Amadablam is the symbolic mountain which refers to the Mother Mountain in Nepal. Climbing expedition in Nepal is the varied experience as Nepal presents unlimited 7000m and above mountains. Come be the part of brave climbers to summit these mountains of Nepal. Ama Dablam is a beautiful mountain, located almost due south of Everest and Lhotse in the Khumbu region. Actually Ama Dablam means The mother mountain also regarded as mother mountain and female. It stands among many 22,000 to 24,000 foot peaks that surround the high valleys of this region, yet stands out by way of its classic beauty It is a steep pyramid of ice with vertical walls and sharp, exposed ridges. And from the summit of Amadablam mountain all round mountains of Khumbu region and both way valley and be viewed, which is a very interesting and exciting moment. On the summit there is space for about one tent so there will be no problems to stay on the summit from 1/2 to 1 hour to enjoy the views and sunshine from the summit of Ama Dablam. Actually 15 to 25 days climbing period would be very nice for this mountain because we will have to wait the weather conditions also sometimes for the climbing and enjoy the view from the summit. This mountain located at Solu-Khumbu District Nepal. The best climbing seasons for Mt. 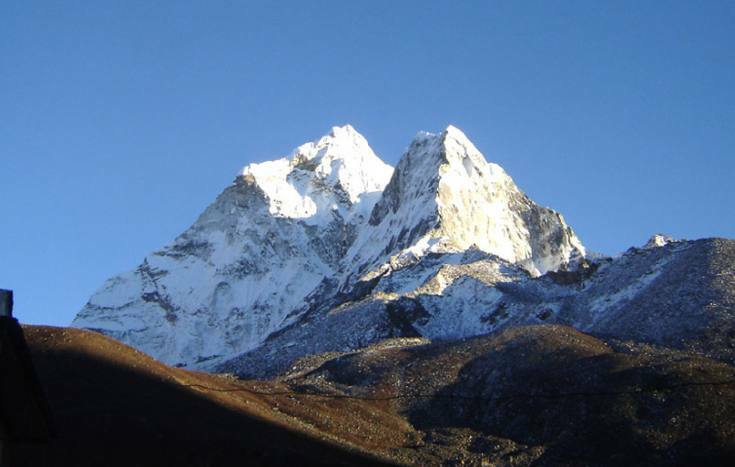 Ama Dablam are in April, May (pre-monsoon) and late September, October. Backpacker Treks and Expedition Pvt. Ltd. comprises of the experienced team of mountain climbers who will ensure of your safety and increment in the adventure and enjoyment while climbing. Amadablam Peak permit, all govt. taxes & garbage deposit. 4 (four) nights hotel in Kathmandu on BB basis. High Altitude Climbing Sherpa (One Sherpa per two clients). North face down jacket for -20 degree. Personal accident insurance and emergency rescue operation. Day 01Arrival at Kathmandu International Airport and transfer to hotel. Stay overnight at hotel in Kathmandu.Stay overnight at hotel in Kathmandu. Day 02Preparation day in Kathmandu. Stay overnight at hotel in Kathmandu. Day 04Trek from Phakding to Namche Bazaar (3440 m.) which takes about 5 to 5 and a half hours. Stay overnight at lodge in Namche Bazaar. This day you trek and cross the river on high suspension bridges. Beyond Monjo(2800m.) is the entrance to the Sagarmatha National Park which was set up in order to protect and preserve this fragile mountain environment. You then ascend quite steeply to Namche and along the way, if the weather is clear, catch a first glimpse of Mt Everest in the distance. You can also enjoy the view of Mt. Kusum Kangaru, Thamserku, Konde-Ri, Tawache peak. You can also visit some of the village monasteries on the way of trekking to Namche Bazaar (3440 m.). Namche is the main trading village in the Khumbu region and holds a busy Saturday market. There is set a meeting place for the Hindu traders from the lowlands and the Tibetan yak caravans that have reached there by crossing the glaciated Nangpa La. Day 05Rest at Namche Bazaar for acclimatization and excursion around the places. Stay overnight at lodge in Namche Bazaar. Namche is tucked away between two ridges amidst the giant peaks of the Khumbu and has an abundance of lodges, tea shops and souvenir shops as well as a magnificent outlook. It is an ideal place to spend a rest day for acclimatization to the high altitude before heading off towards Tyangboche. For the acclimatization you walk up to Khunde Hospital which was set up by late Sir Edmund Hillary, or a one hour walk up to the Syangboche (3800m.) where Everest View Hotel is situated above Namche for the outstanding view of Everest, Nuptse, Lhotse, Ama Dablam, Thamserku and Kusum Kangaru. There are also good views from the National Park Centre and Museum just above the town. Day 06Trek from Namche Bazaar to Tyangboche (3850 m.) and it takes almost 5 hours. Stay overnight at lodge in Tyangboche. From Namche, the trail contours around the side of the valley, high above the Dudh Kosi. Now, you have a glimpse of first really good views of the great peaks of the Khumbu including Mt Everest, Nuptse, Lhotse, Ama Dablam, Thamserku and Kusum Kangaru. Passing by several villages and numerous tea shops, the trail descends steeply to a bridge over the river Dudh Koshi at Phunki Tenga (3250m. ).The village has an excellent place for lunch and you can take a short rest before making the steep climb to Tyangboche. Although exhausting due to the zigzag path, the trek has numerous attractions like rhododendron bushes, beautiful birds chirping and superb mountain scenery making your trek exciting. Tyangboche is famous for its legendary monastery, the largest in the Khumbu region. Day 08Day 8 to Day 24 Climbing period for Ama Dablam. Stay overnight at camp. Base camp (4600 m): Situated on a large grassy meadow with a wonderful views. To yak camp (5400 m): We use yaks to carry most of our equipment for this section, which saves us three to four hours of heavy work. There is a rough track over very rocky terrain, which the yaks and we use. To camp I (5800 m): Your first real camp is only one and a half hours walk above Yak camp. This section is marked by rock cairns and involves boulder hopping and some easy scrambling. You sometimes fix a couple of sections with rope to be used as a handrail. Camp I to Camp II (6000 m): Now, you are really climbing. This section of the route is usually rock climbing only, depending on the season. The granite is high quality and the moves fun, challenging and exposed but “do-able”. You follow a narrow ridge, switching back and forth on each side of the ridge. This is the hardest rock climbing of the entire route. In places the exposure is extreme and you are very thankful of the fixed ropes in place. Whilst it is generally easier not to pull on the ropes all the time if you are finding the going getting a bit too hard you can just rest on the fixed rope. You can also use your jumar to help you over the odd spot of difficulties. Most of the climbing on this section is traversing on rock, so good rock climbing skills will help you move efficiently and quickly over this terrain. Camp II: Situated on top of the Yellow Tower on a narrow platform ,this camp site is rather exposed and has fantastic views. If you dropped your cup from here, it would probably land in base camp! Camp II to Camp III (6300m): Now, for the hardest snow and ice pitches of the route we follow a system of steep snow and ice gullies up to join a feature called the Mushroom Ridge. Whilst the ridge itself is not as technical as the gullies leading up to it, the exposure here is palpable. It is a narrow, windy, snow mushroom-like ridge with giant Himalayan peaks in the background. This feature leads us up onto a small plateau at 6300 m, which serves the purpose of camp three. Camp III: A cold and exposed position is the start of your summit push. The Sherpas will often use a full climbing rope to tie our tents down as the natural shape of the mountain can at times unfortunately funnel the wind to this location. It is, however,the only safe flat piece of real estate within range of the summit. Summit day: The initial route is to the right of the huge “Dablam” (ice cliff), up a moderately steep slope, which is often iced. Once past this feature we move toward the centre of the face. The angle eases slightly and a couple of tough hours later we emerge on the summit (6856 m). The summit is the size of a tennis court and allows us to move around and take pictures. Five of the world’s six highest peaks are clearly visible, with many other 7000m and lesser peaks filling the gaps. Day 25Trek from Ama Dablam Base camp to Namche. Stay overnight at lodge. Day 26Trek from Namche Bazaar to Phakding (2652m.) which takes about four hours. Stay overnight at lodge. The trail descends steeply for early one and a half hours. After that, the path has small ups and downs to Phakding through Monjo. Day 27Trek from Phakding to Lukla (2886m) which takes about three hours. Stay overnight at lodge. Your final day's trekking follows the Dudh Koshi back down to Lukla. Day 28Fly from Lukla to Kathmandu and transfer to hotel. Stay overnight at hotel in Kathmandu. Day 29Rest day in Kathmandu. Stay overnight at hotel in Kathmandu.